Andy: I have had other kinds of Ron Barcelo, but the Dorado tastes like chemicals to me. It has a dry, empty taste with no sweetness or richness to speak of. I really don’t care for it straight. It really has the taste of a basic light rum, even though it has the color of a gold rum. I really don’t care if I ever have this rum again. Really not thrilled with it. 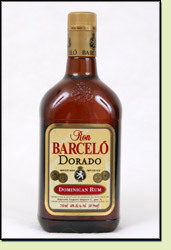 Adrian: The Ron Barcelo Dorado isn’t that bad, especially for the price. It tastes pretty good mixed with Coke Zero and is a decent option for the price.